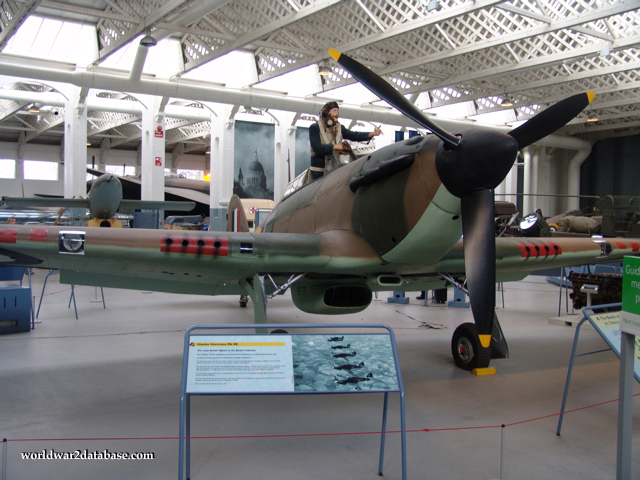 This Hawker Hurricane IIb shows the eight .303-caliber (7.7 mm) Browning machine guns. The Mark IIb also carried either two 250-pound (113.4-kilogram) or 500-pound (226.8-kilogram) bombs or fuel tanks. This static display is painted as "Z2315" with the markings of 111 Squadron, a Czech fighter unit based at Drem during the Battle of Britain. 111 Squadron developed the head-on attack concept against bombers. The airframe was completely restored after it was dug up in Russia. Very little is known about the original aircraft (BE146).